Home Top News	Up With Jesus. Down With Santa! Americans are on target to spend almost $700 billion on Christmas and Thanksgiving holidays to the first of next year, but activists, entrepreneurs and organizers have escalated boycotts to curb holiday spending in their fight for justice and battle against racism and police brutality. 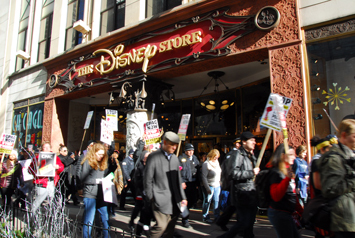 Across the country, there have been “buycotts,” petition drives, and protests outside shopping malls, such as the Magnificent Mile, where some 300 demonstrators blocked entrances to stores in Chicago’s upscale shopping district on Michigan Avenue after Thanksgiving. The Chicago Alliance Against Racist and Political Repression called the Black Friday Boycott for Nov. 24 to underscore determination to get justice for 17-year-old Laquan McDonald, who was killed by Chicago Police Officer Jason Van Dyke on Oct. 20, 2014. “They don’t issue a report telling us about what profit losses we cause, but we know we caused some because we passed out several thousand flyers, and there were people who would have been shopping in those stores that walked right on by them,” Mr. Chapman told The Final Call. There was mass media coverage of the protest, a mass police presence, and two police snipers situated on nearby roofs, he said. “They don’t care about us demonstrating in our own neighborhood, but when we come down there, in the central business district of this city, and start raising hell, they care about that. They don’t want us down there … We’re going to continue to go down there until we see some justice,” Mr. Chapman told The Final Call. 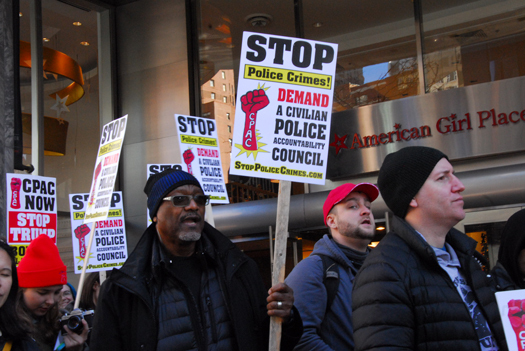 A multi-generational, multi-racial crowd participated in demonstrations in downtown Chicago calling for police accountability during Black Friday. Their next move is to go after the banks, namely Chase Bank and Bank of America, for their roles in bilking Blacks out of wealth during the mortgage scheme of 2007-2008. The plan is to ask everyone, but particularly Blacks, to shift money from those two banks and Wells Fargo, into Black-owned community-based credit unions, such as the Trinity United Church of Christ Federal Credit Union. His sentiments reflect the Honorable Minister Louis Farrakhan’s call for the “Up With Jesus! Down With Santa!” national economic boycott of commercial spending. Stop shopping until the end of this holiday season, Jan. 2, 2018, or shop with Black-owned businesses, not those who could care less for Blacks, and make mockery of their real love for Jesus during “Christmas,” instructed Min. Farrakhan during organizing for the Justice or Else! gathering that marked the 20th anniversary of the historic Million Man March on Oct. 10, 2015 in Washington, D.C. He gave the command, “Up with Jesus! Down with Santa!” following the beautiful instructions of Dr. Martin Luther King, Jr.
“Christmas is a pagan holiday that the enemy invented; it came out of the Babylonian era,” the Minister said. Sun worshipers that were heathens would go in the forest and cut down a tree, deck it with silver and gold, and fasten it with nails on the floor, Min. Farrakhan said. The practice is condemned in the Bible, Jeremiah 10:1-5. When the pagans became Christians, they didn’t give up pagan practices. Those practices were simply incorporated in their new Christian religion. “Did you know that when you put your lights on, put it all over your house, put a candle in the window, and a wreath, that’s because the people worshiped the Sun?” Min. Farrakhan observed. On Dec. 21, the shortest day of the year, sun worshippers thought their god was leaving them, so they burned a yule log, lit candles, and cut a tree out of the forest to entreat their god back to them. When Constantine decided to become a Christian, instead of a pagan, he substituted the worship of the sun for worship of the son of God, said Min. Farrakhan. ChristmasholidayJesusjustice or elseRedistribute the PAINShoppingThe Honorable Minister Louis FarrakhanUp With Jesus! Down With Santa!